What if there was a book that pre-dated the Book of Kells? 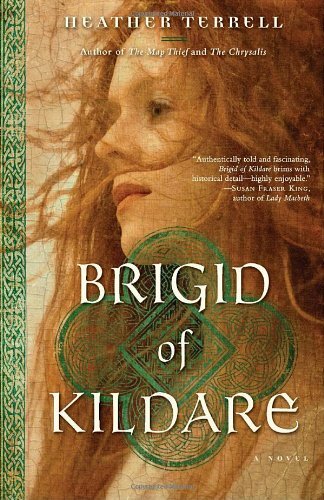 I didn’t know anything about Saint Brigid when I was reading this, so I liked that I was discovering the book and Brigid herself as I read along, sort of like Alexandra was. I liked the fact that there were three points of view. One was from Alexandra’s perspective, the second was Decius, in the form of letters he was writing to his brother, and the third was an omniscient narrator, as if it was narrating the biography of Brigid. They weren’t confusing at all, despite moving backwards and forwards in the story as a whole. Interesting thing to note: instead of this book involving matters of pagan vs. Christianity, it was more like Christianity vs. Christianity. Rome wanted Ireland and Brigid to run the Church in a specific way, but Brigid defied those rules. She incorporated bits of the pagan rituals into her mission to convert her people. She eased them into it. Decius, who was meant to report back on all this heathen stuff, found himself converting too in a way. Brigid here is portrayed as a gentle person just trying to spread the word of Christianity in the way that she thinks is right. Granted, it might seem a bit too forced that this happens, but it works here. For such a skinny book (256 pages), there was a lot of narrative and information packed in there. I’m not sure what else to say, other than I enjoyed it and I would definitely recommend it to others.